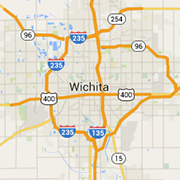 How is a Wichita Beer Made? Home > Blog > Food and Beverages > How is a Wichita Beer Made? The 360Wichita Winter Wheat is back at Hopping Gnome Brewing Company! The popular beer will be back on tap starting December 4th. If you're curious what making a Wichita beer is like. We got to spend a day with Torrey Lattin, Owner and Head Brewer at Hopping Gnome seeing every step along the way as we brewed a special winter beer, the “360Wichita Winter Wheat”. Here’s what a day of brewing at the Hopping Gnome looks like. The day starts early as the entire brewing process takes about five hours. The first step is the mash conversion. In this step, they take their malted grains and mix them with hot water. The starches in the grains are broken down into sugar. This sugar is what the yeast will later feed off of. For your average Hopping Gnome beer run, there are about 350 pounds of various grains. In the 360Wichita Winter Wheat, there are four different grains, one of which is a special midnight wheat. It’s a roasted winter wheat grain and gives the beer its dark appearance. This is all added to around 150 gallons of hot water so it can steep. After the mashing process is finished, the sugars are then removed from the grain in a process called sparging. In an overly simplified explanation, it essentially rinses the sugars from the grains with hot water that’s poured over the top. It then runs through a false bottom in the mash tun. Once every last bit of sugar is pulled from the mash you are left with a sweet liquid called wort. The wort is transferred from the mash tun into the brew kettle to get ready for the boil. While not necessary at this point, cleaning of the mash tun and other equipment happens while the wort comes up to temperature. Cleaning is especially important for breweries like the Hopping Gnome who produce several varieties of beer on a continual basis. You don’t want flavors from one beer affecting a different batch of beer—or worse, ruining an entire batch. Nobody wants to see 150 gallons of beer go down the drain. Hops are an aromatic flower that gives beer its distinctive taste. Hopping Gnome uses the pellet form of hops (as opposed to the full flower variety you’ve likely seen in a beer commercial at some point). The pellet form allows for the same flavors while using fewer hops, and takes up much less shelf space when being stored. The wort is then boiled and reduced. When a beer recipe calls for spices along with hops, the type of beer and intended flavor will dictate when those are added to the boil process. Once the boil is complete, the entire tank is pumped through a heat exchanger. In this step, the beer is rapidly cooled from the boiling temperatures, then it’s on its way to the fermentation tank. Yeast is added to the fermentation tank along with the now cool wort. The yeast will consume the sugars in the wort. During this process, carbon dioxide and alcohol are produced and in just a few weeks, a delicious Hopping Gnome beer will be ready to enjoy.